I've never thought of ASRock as being very good, but I was pleasantly surprised by this mobo. After I finished installation, it worked great, and the wifi was actually quite fast. However, I have a few gripes with the installation. The main issue is with the installation of the wifi. There is an manual booklet with the mobo, but it says nothing about the wifi. I figured out how to do it though. For the record, you take the wires with the gold things at the end, and plug it into the tiny gold ports on the wifi module, which you can find using the diagram of the mobo in the manual, and then put the other side through the holes in the IO shield and secure it with the nuts. The issue with the wifi installation for me wasn't the lack of instructions, however. It was that it was EXTREMELY difficult to plug the cables into the TINY gold ports on the wifi module. It took me a good 15 minutes and a decent amount of force to plug both in, and that's with the motherboard out of the case and no other components installed If you have a fully assembled system and the cable came out somehow you'd probably have to disassemble a bit to get it into a good enough position to plug them back in. That was my main gripe with the board, but I also had some strange issues with the CPU fan. The custom curve controls were acting very weird for me. Whenever I set the fan speed to below 50%, it would turn off (surprisingly, at idle the temps were still about 50 with the fan off), and when I turned the speed over 50% it would jump to about 2500 rpm, which is quite loud. The fix is to go into advanced mode in the bios, then manually change the CPU fan mode from "auto" to "4-pin". Then it worked as expected. All that being said, the mobo worked great after installation. The BIOS is nice and easy to use, it boots quickly with Fast Boot enabled in BIOS, the wifi is fast, and the logo you see on boot isn't gimmicky and weird like on MSI and Gigabyte. This board surprised me, as a lot of the reviews I read online basically stated the board was low-budget with crappy wi-fi, that was difficult to install. What I've found from working with it is that it's a decent entry-level mini-ITX board with a decent BIOS and good wi-fi. For the price, you can't beat this motherboard. Very few if any Skylake boards at this price point have wi-fi built in. 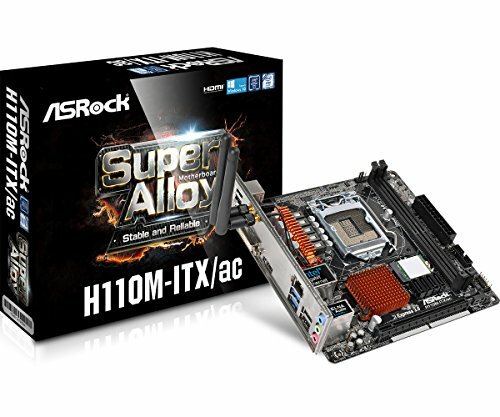 To do this, ASRock added a M.2 wi-fi card, with little cables that connect to the card and run to the backplate, or case, depending on your build. The connectors are just like the ones on laptop cards, only much smaller. They're a little tricky to install, but not difficult. Unfortunately, the M.2 slot doesn't support adding a SSD, only the wi-fi, and to me, this is the biggest limitation of this board. Aside from that issue, setup and use has been seamless for me. If you need an inexpensive mini-ITX board with wi-fi, check this out. The cheapest motherboard with Wi-Fi. I've had good experiences with ASRock in the past, and this one is a solid performer as well. Bluetooth was a bonus. Mini-ITX boards are tiny! The Wi-Fi antennas and wires don't come preinstalled. You need to plug the wires into tiny connectors on the motherboard's Wi-Fi adapter, and then you need to tighten the wires' other ends to the I/O shield at the back of the case, which is an even greater pain. Got it alright in the end. This might sound like I'm not happy with this motherboard, but I really am. It's very cheap, but really feels like a more expensive board, so I guess I kind of treat it like that. This isn't the fastest, most pretty mini-ITX LGA1151 motherboard out there, but it was one of the cheapest I could find on eBay with built-in WiFi. It works great, though, and I don't really have any complaints, except that the WiFi doesn't always get a super good signal, and the heatsinks are this clashing orange. I attempted to paint the heatsinks, but my paint was not the correct kind, so I cleaned them with paint thinner. I may try later to respray them with a different paint, to match the build. Great motherboard with WiFi and Bluetooth. Only gripe is that the WiFi connectors are super hard to get on. Cheapest ITX motherboard I could find. I had to buy a Skylake CPU, flash this mobo's BIOS, and return the CPU to make the H110M compatible to my Pentium G4560. Was a bit of a hassle but it was definitely worth saving $50 that I would've spent if I went for the H270M, the cheapest Kaby Lake ITX motherboard that was out at the time. I didn't like how the antenna cables need to be attached to the WiFi card on the board. It took me a good half hour to do so because of my fat fingers and fear of breaking anything. The antennas are very hard to screw in and they still stay a little loose just outside of the IO shield. Other than the hassle to flash the BIOS with another CPU and the awkward installation of the cables and antennas to the WiFi card, this is a great motherboard and the cheapest for ITX builds.